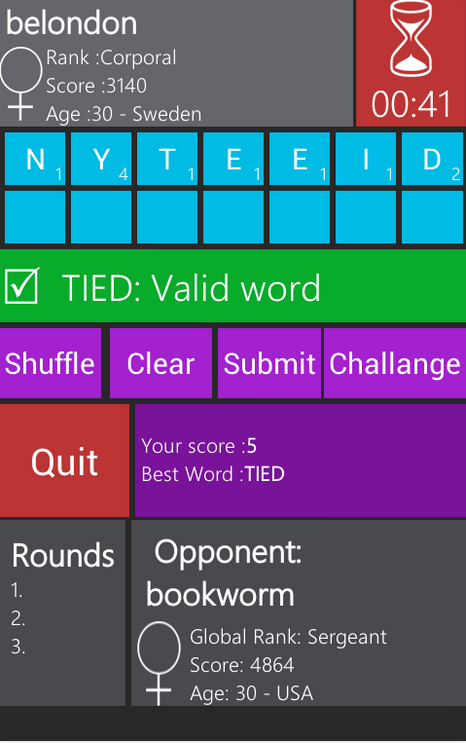 WordWarX Word Game is an Android App developed by 1303productions that promises to challenge your skill with words, no matter how good you think you are. 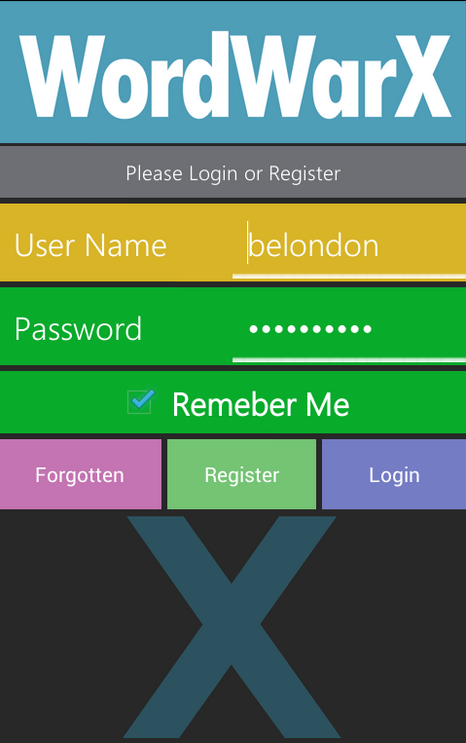 On launching the App you’re prompted to register an account in order to use WordWarX. Signing up allows you to access the multiplayer feature built into the app, enabling you to challenge players worldwide. WorldWarX features four different game modes which are all played online against other players from around the world. The first mode is ‘Thinking’ in which you get 60 seconds to find as many words as you possibly can and the winner is the one who scores most points by using the most words which all have a Scrabble scoring value. This mode is the only mode available when downloading the free version of the App. Another game mode is called ‘Strategy’ where you must find a word and then stop the clock when you think you have the best word available. The ‘Speed’ mode challenges players to find at least a four letter word in the quickest time possible – a mode I found incredibly challenging. The fact you know you’re not only up against the clock but a real player really inserts panic into trying to find a word and you usually end up with a mind blank. 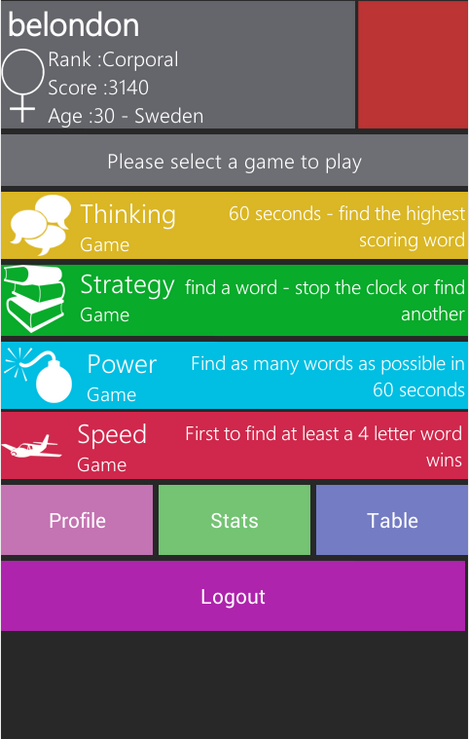 The final mode is ‘Power’ where you are challenged to find as many words as you can in 60 seconds. WordWarX for Android features a fully fledged leadership scoreboard where you can check your score against other players around the world. This is the reason you have to register so that the scoreboard can be used to track your score. The gameplay is extremely good, and very addictive, especially because it is based around a multi-player concept that means you’re not hitting the same CPU logic which can often appear repetitive in similar games. The mulitplayer matchmaking is also extremely quick, which is a major plus for WordWarX. The game is laid out in what I would describe as a Windows-esque style with differing coloured squares and rectangles which aims to provide a simple and easy to understand layout. I didn’t seem to get on with the layout very well, and often thought it was somewhat outdated to the design philiosphy we are now seeing in apps. Although simple, and that seems what the developers are going for, I feel WordWarX would benefit from toned down colours to give it a modern cleaner look – the colours just don’t work too well together. Bar that minor criticism, WordWarX is incredibly addictive and I only found myself putting it down out of frustration because I lost. 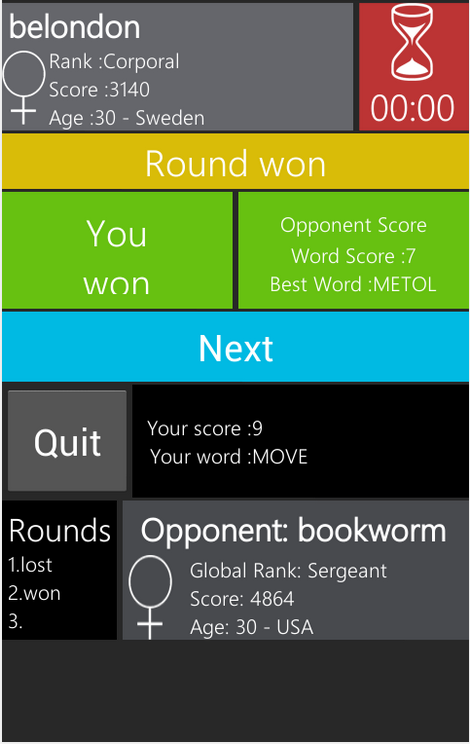 WordWarX is available from the Google Play Store for £1.31 to unlock all 4 game modes, or for free for just the ‘Thinking’ mode. WorldWarX requires Android 2.2 and up. A small expedite fee was paid to speed up the publication of this Android game review.